High school is tough. Aside from the need to fit in, there’s a desire to stand out. In our attempt to achieve the latter, however, some of us go to embarrassing extremes, as is the case in Chūnibyō demo Koi ga Shitai!, a.k.a. 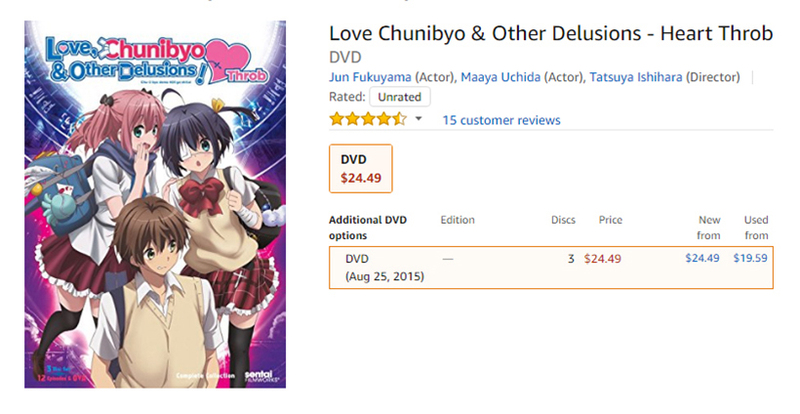 Love, Chunibyo & Other Delusions. Yūta Togashi wants to distance himself from the embarrassing, make-believe “Dark Flame Master” persona he created for himself in junior high. 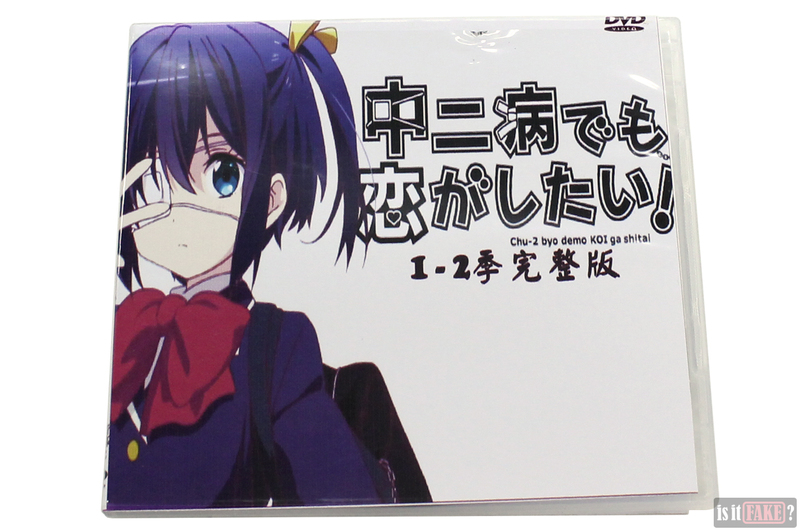 A fresh start in high school would have done the trick, if it weren’t for Rikka Takanashi – a girl with similar delusions who has taken a liking to him. As the two bond over shared experiences, they learn from each other lessons vital to survival not only in school, but also in life. It’s a great story made more wonderful thanks to laugh-out-loud comedy and heartwarming romance. 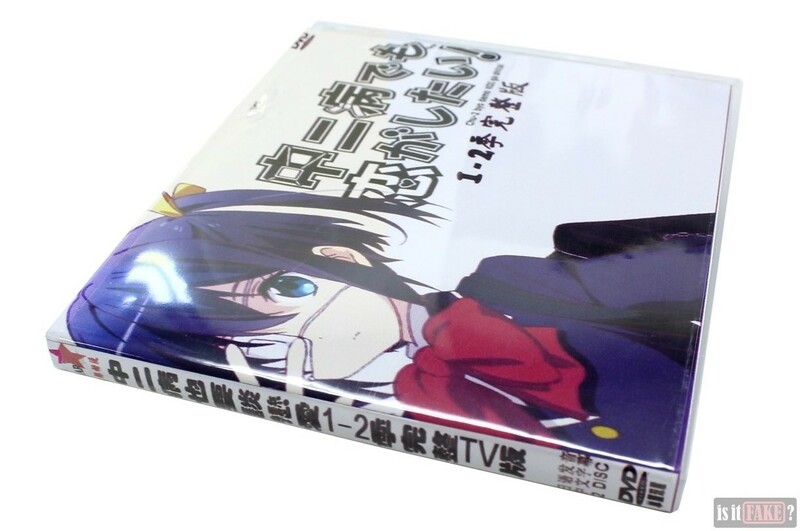 Unfortunately, the series’ popularity has made it a prime target for pirates, who’ve seen to illegally producing low-quality DVDs of its 2 seasons and movies. By now you should already know the drill: Chinese online stores are chock full of low-quality fake products. Unless you’re addicted to pain and disappointment, avoid them at all costs. We acquired this pirated Chūnibyō demo Koi ga Shitai! DVD set from one such site. Unlike some pirates, the manufacturer of this product has identified itself as 翔龍卡通, or Xianglong Cartoon. While a few Google search hits did bring up anime DVDs bearing the brand name, there isn’t much information on Xianglong Cartoon itself. As you can guess, however, these DVDs are being sold on Chinese online stores, so there’s little question as to what kind of “enterprise” Xianglong Cartoon engages in. 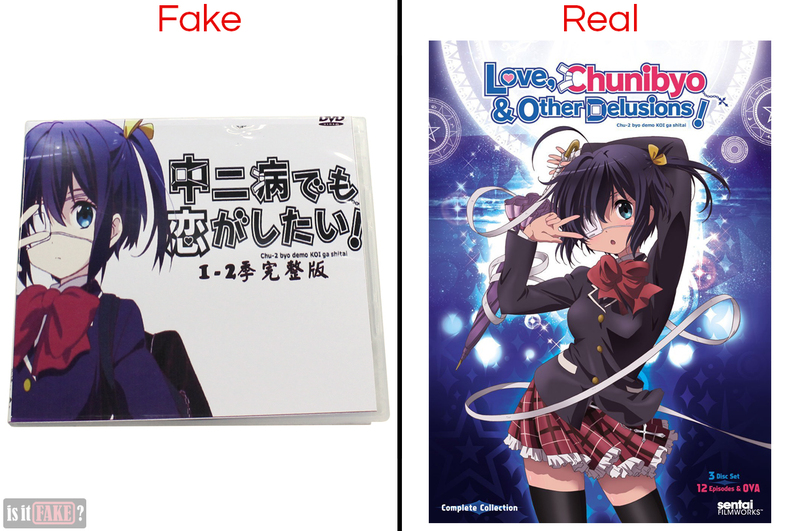 The fake Chūnibyō demo Koi ga Shitai! 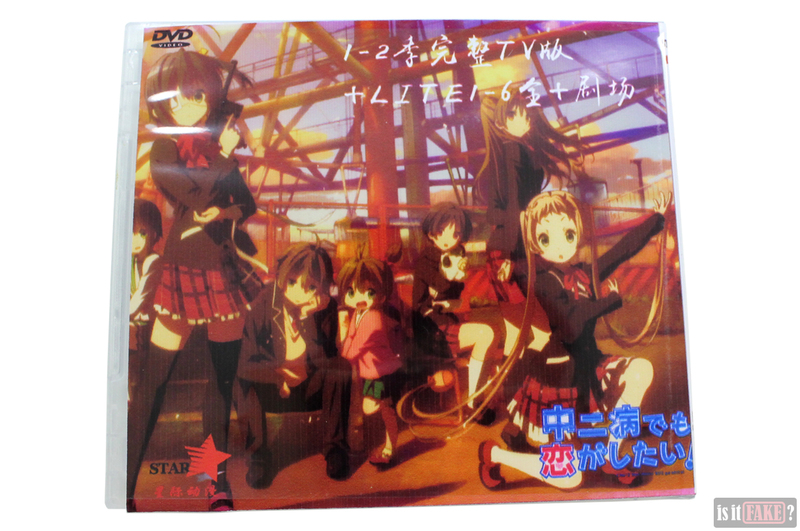 DVD set comes in a standard 120 x 120mm plastic optical disc packaging. 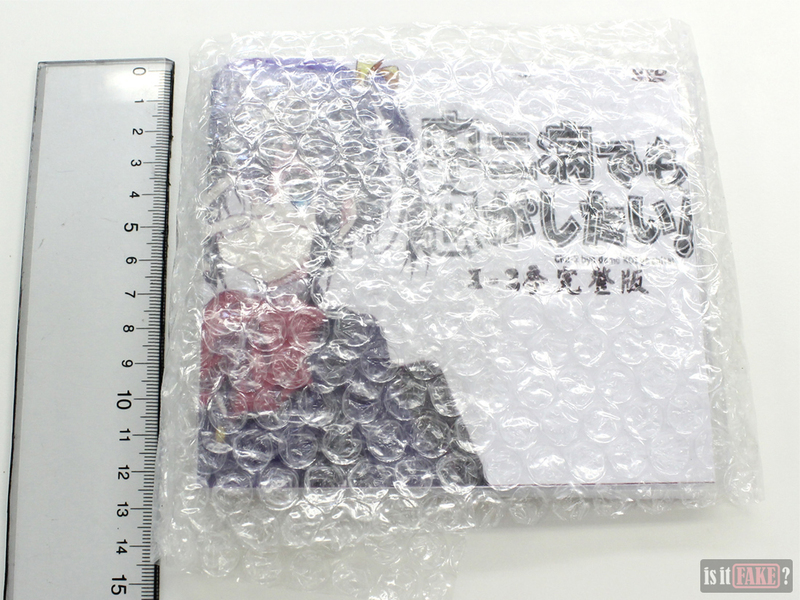 A transparent plastic film is spread taut across the disc case’s outer surface; inserted behind this film is a sheet of paper that serves as the case’s front and back covers. The paper isn’t properly positioned however, so that its sides don’t align with the case’s. Because of this, the visuals are askew, and the edges of the paper extend outside of the plastic. The front cover is adorned with the official Japanese Chūnibyō demo Koi ga Shitai! title and logo. Due to the bad layout of the art and the awkward positioning of the paper, however, the title’s rightmost side is cropped. Similarly, the DVD logo above it is cropped. 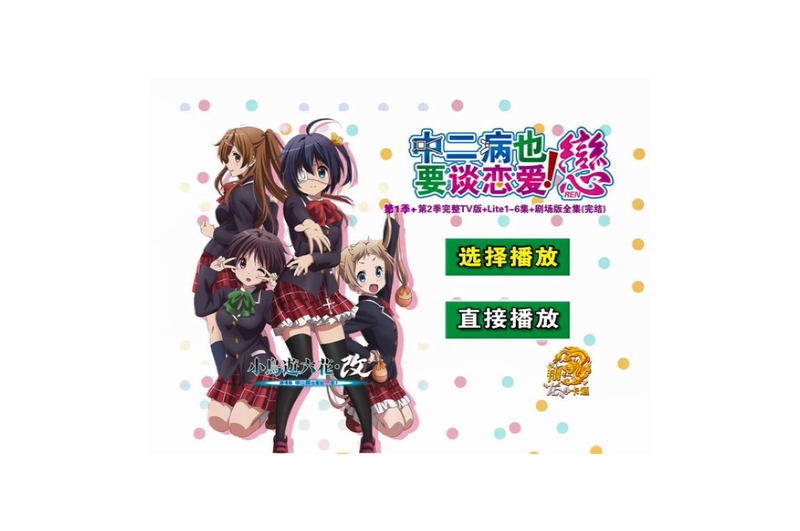 Below the title are Chinese characters stating that the DVD set comes with seasons 1 and 2 of the show. The side of the case contains the title in Chinese. The characters also say the set includes the complete TV edition of the show, complete with seasons 1 and 2. At the top is a logo featuring a red star. We’ll discuss this image further below. The back cover features the colored version of the official title and logo. It is cropped as well. At the top of the back cover, Chinese characters once again state the package includes seasons 1 and 2. Below that, more Chinese characters say that it also comes with episodes 1 to 6 of the animated “Lite” shorts, as well as the movie. On the lower left corner of the back cover, you’ll find the red star logo again. It’s difficult to say what the Chinese characters below the star say, as they’re so blurred they’re unreadable. As for the star symbol itself, it’s a generic logo used by several companies around the world. It’s therefore difficult to say what specific organization this logo represents in this context. Though both the front and back covers use official art from the series, their print quality is terrible. The back is particularly bad; the image is not only blurred; it is also marred by vertical lines. This is a sign that the piracy group’s printer was low on ink when it was used to create this image. The DVD case opens to reveal two discs. Each is decorated with a sticker printout. 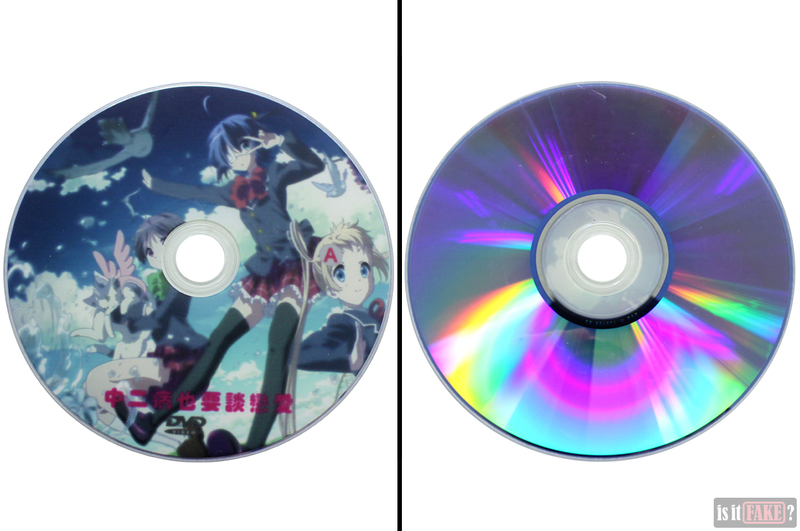 The print quality of Disc A is hideously blurred. Disc B may not be as blurred as A, but it’s riddled with the same lines that we find on the DVD case’s back cover. We had no problems getting the DVD discs to autorun. What proved most shocking, however, was the piracy group’s shameless use of the Disney Nature animated logo to promote their own “brand.” Check out the video below to see what we mean. The piracy group superimposes the Chinese characters “翔龍卡通” over the “Disney Nature” title. As mentioned earlier, these characters translate to Xianglong Cartoon. This is how we know who manufactured these DVDs. 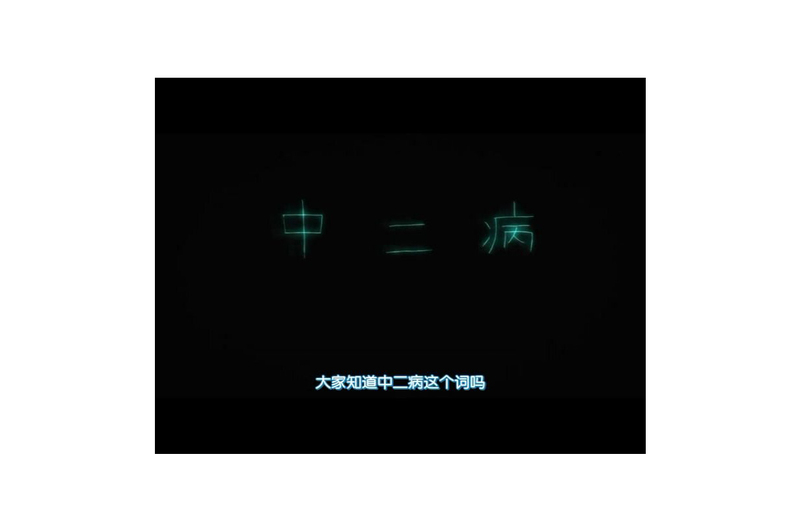 Below 翔龍卡通 are Chinese characters claiming that the animation brand is professional, high-quality, and high-definition. The main menu gives us the title in Chinese, and information we’ve already been told on the covers. The two green buttons give you the option to select episodes or play all of them. On the lower right corner of the main menu, you’ll notice a golden dragon logo. Like the red star logo on the side and back cover of the DVD case, this is a widely used symbol. But the dragon itself is not what’s interesting about this logo – it’s the Chinese characters attached to it. They spell “Xianglong Cartoon,” once again identifying the piracy group that manufactured this DVD set. In case you were wondering, “Xianglong” means “soaring dragon,” which explains the pirates’ choice of logo. 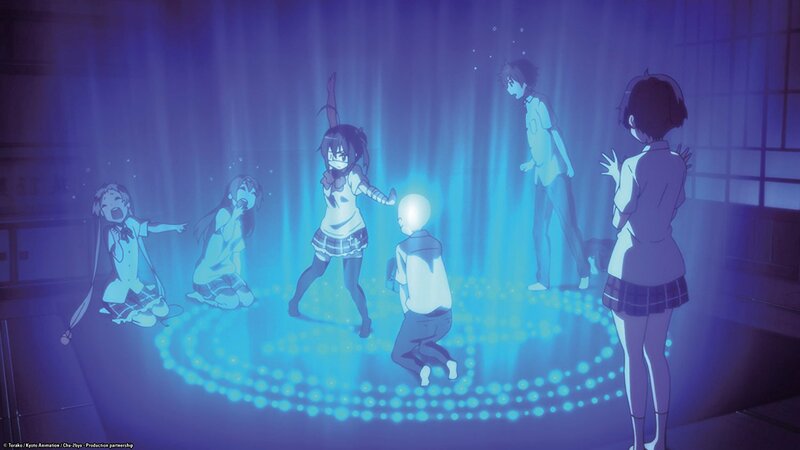 On the left, positioned over the picture of the girls, are Japanese characters that state the title of a movie in the series: Takanashi Rikka Kai: Gekijō-ban Chūnibyō demo Koi ga Shitai! 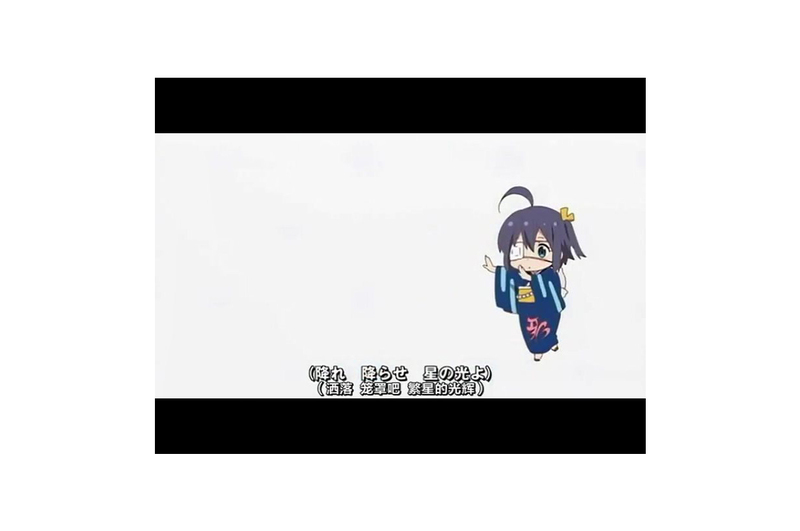 An early scene naming legal Japanese entities Pony Canyon, Kyoto Animation, and Lantis also reveals 澄空学园, a.k.a. 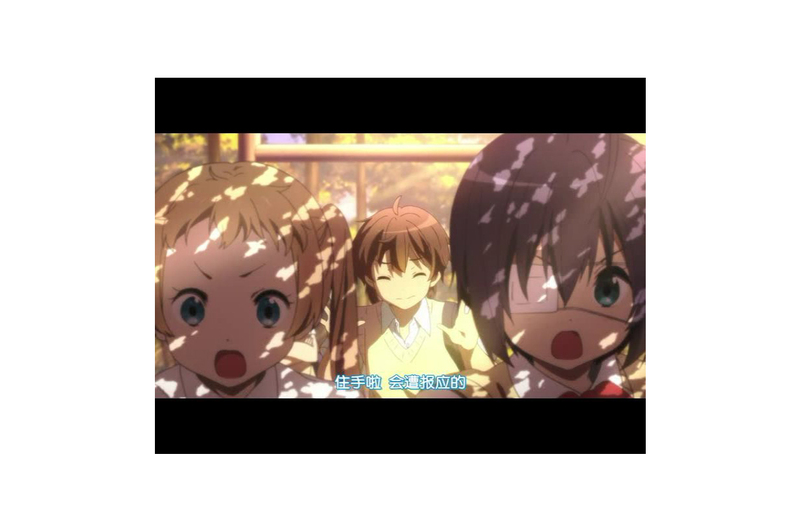 SumiSora, as the Chinese fansub group responsible for the subtitles. 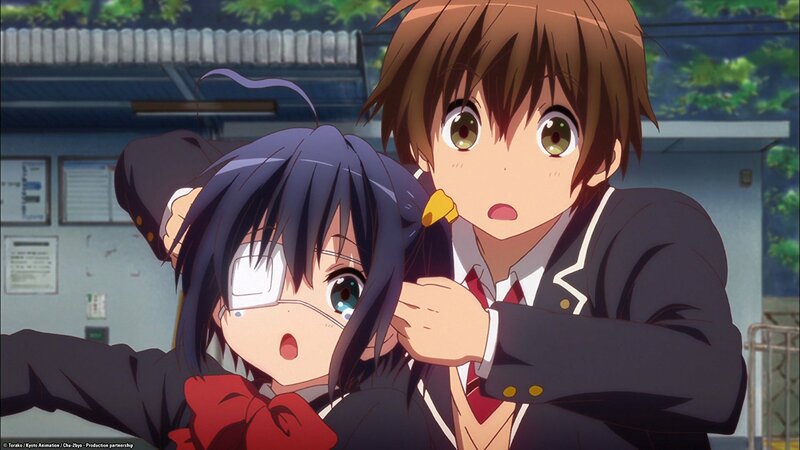 SumiSora has provided Chinese subtitles for a wide range of anime. Their reproduction of Chūnibyō demo Koi ga Shitai! is based on a rip of the official Blu-ray product. As expected, the only available subtitles are in Chinese. As they’re hardsubbed, there’s no way to turn them off. To make matters worse, the video quality is below average, with the tiny resolution meaning the image pixelates whenever you enlarge the screen. The inferior quality can be explained by the piracy group’s decision to squeeze 4 Blu-ray discs’ worth of content into 2 DVD discs. You don’t have to break the law to watch Chūnibyō demo Koi ga Shitai! You can buy the high-quality DVD/Blu-ray releases from its official international distributors, or view it online for free via a legit streaming service. 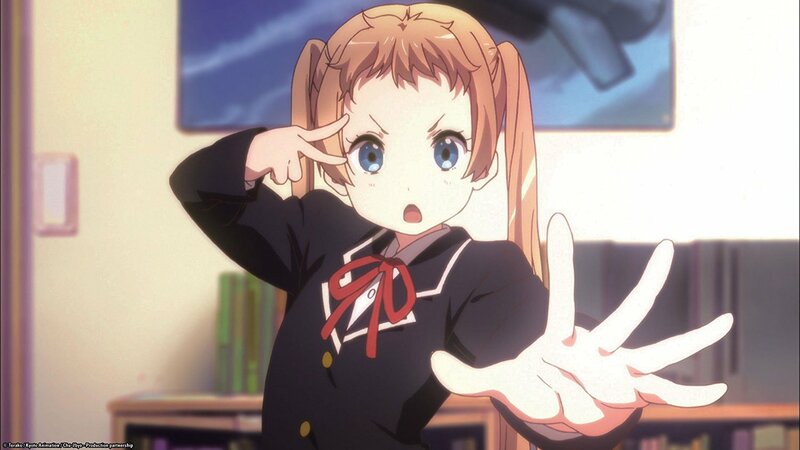 American anime licensing company Sentai Filmworks offers various legal ways to watch Chūnibyō demo Koi ga Shitai! 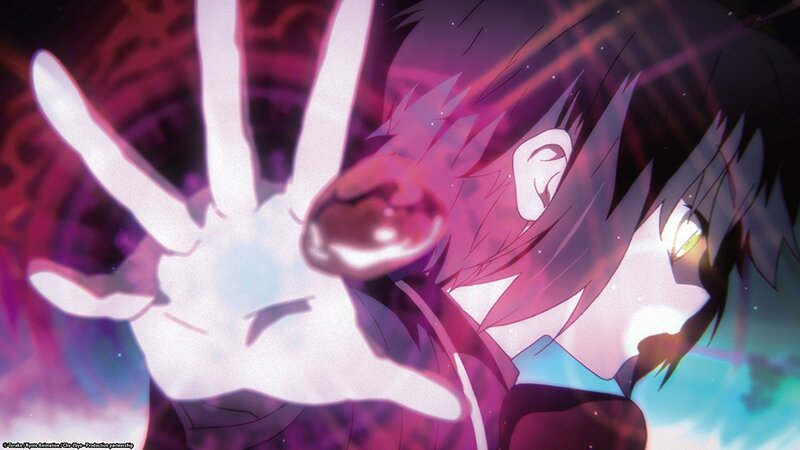 Sentai Filmworks has an extensive catalog of its anime shows, which includes the series’ 2 seasons and movies. You can also use the search function to find all products related to it. 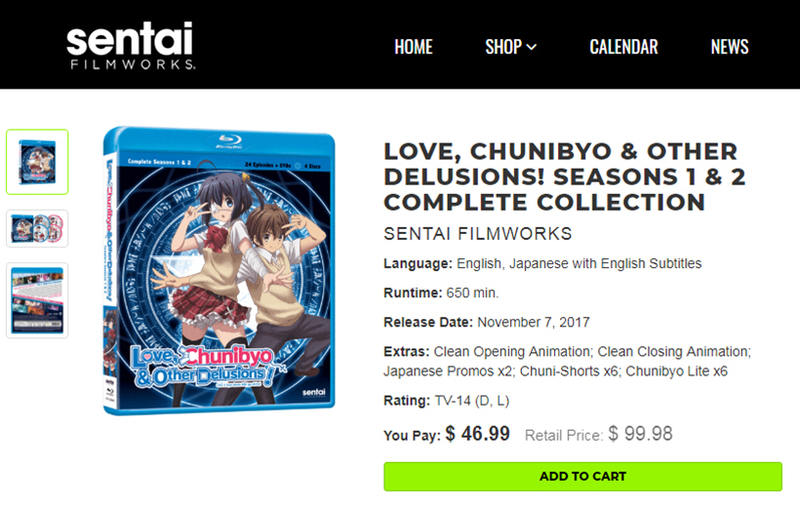 The Sentai Filmworks’ online shop is where you can purchase the Chūnibyō demo Koi ga Shitai! season 1 and season 2 DVD sets. Season 1 comes with Japanese audio with English subtitles, while Season 2 comes with Japanese and English audio plus English subtitles. 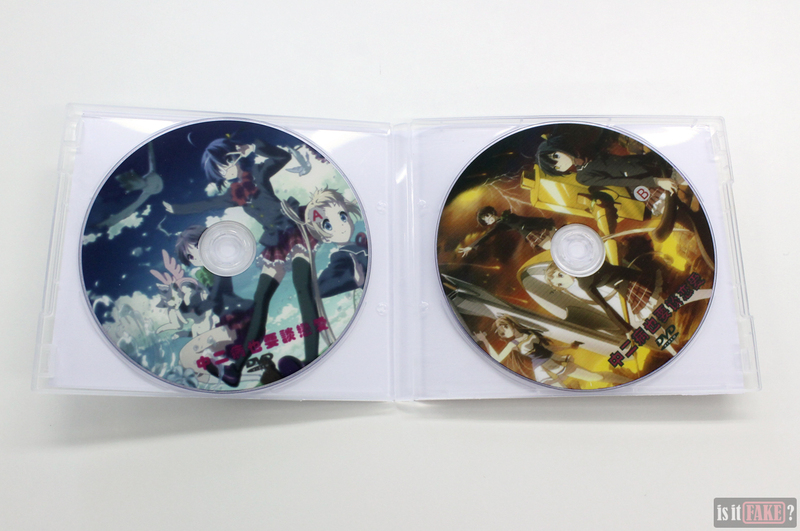 Each set comes with 12 episodes spread across 3 discs, which explains the high quality of the videos. 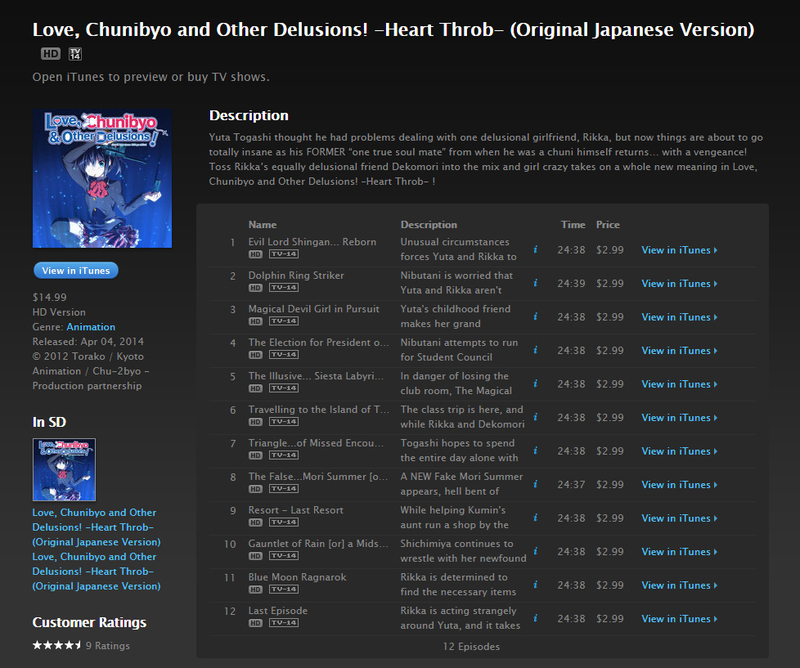 Alternatively, you can purchase the Blu-Ray set, which consists of both seasons. This set has 4 discs and a number of bonus goodies, including the 12 Lite mini-episodes from both seasons. 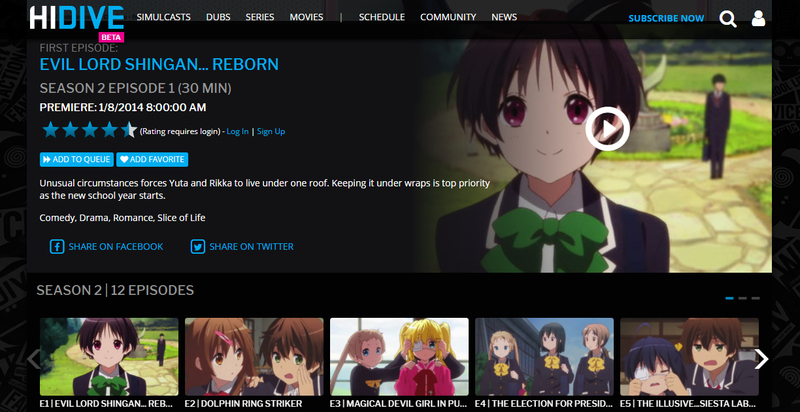 The Sentai Filmworks site also provides links to where you can watch season 1 and season 2 on HIDIVE. HIDIVE requires a monthly subscription of $4, but it does offer a 7-day free trial, so you can watch Chūnibyō demo Koi ga Shitai! and a bunch of other shows for free. 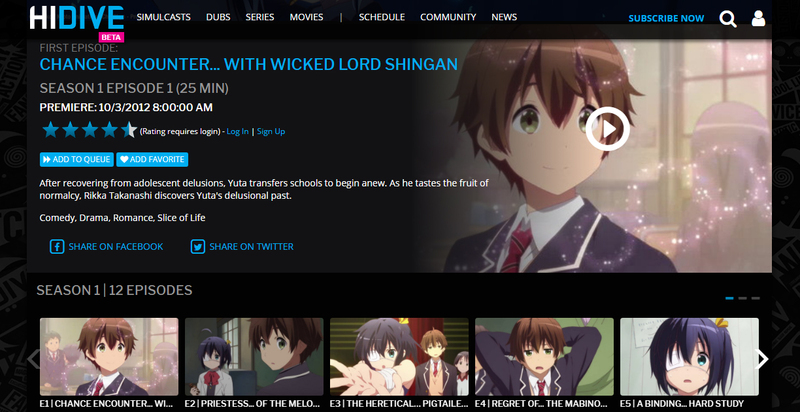 HIDIVE isn’t available in all regions, however. 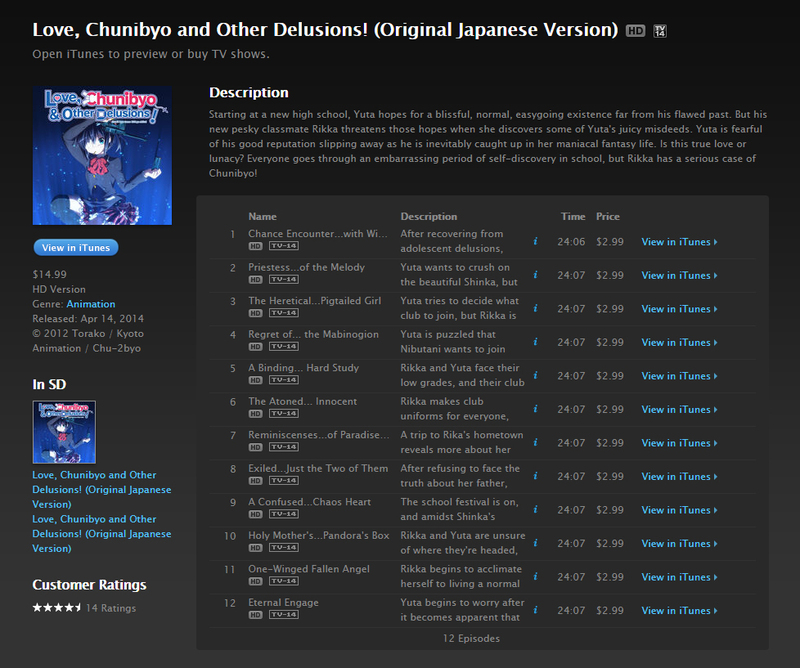 You can also view both seasons on iTunes; just click here and here. The season 1 and season 2 DVDs are also available on Amazon – just make sure you select the Amazon store, and not any of the third-party sellers. While there are third-party sellers who are completely legit, a few do peddle fakes on Amazon. If you’re unwilling to do the legwork and want to avoid the risk of ending up with a bootleg, we strongly advise against purchasing from them. UK-based distributor Madman Entertainment also sells DVD and Blu-ray sets on their online store. The Madman DVD releases come with the Lite episodes. 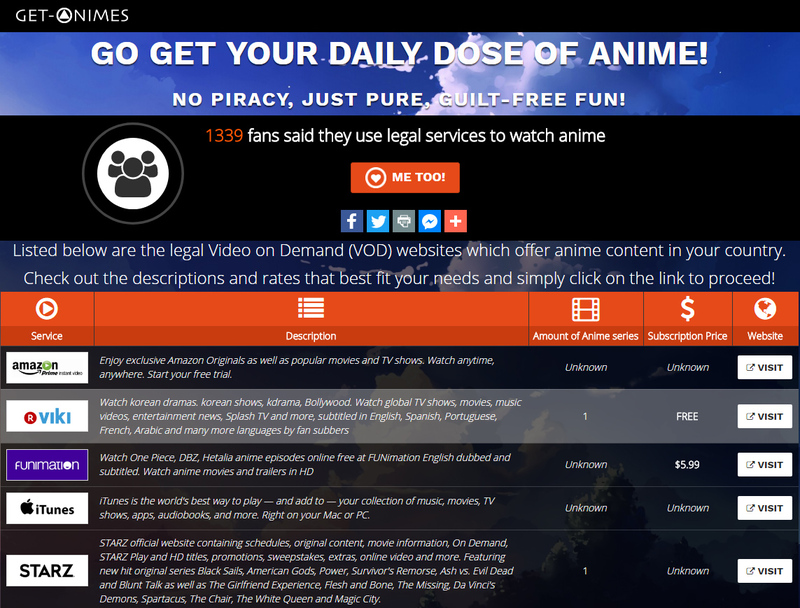 Don’t forget to visit Get-Animes for a list of legal VoD services! Chūnibyō demo Koi ga Shitai! is a magical show. When it’s reduced to a combination of poor-quality videos, Chinese-only subtitles, and unsightly packaging, we can’t help being more than a little miffed. This pirated DVD set gets a 95% terrible rating from us.